Genode FX is a composition of hardware and software components that enable the creation of fully fledged graphical user interfaces as system-on-chip solutions using commodity FPGAs. Genode FX executes a full GUI software stack on a soft core CPU implementation (e.g., Microblaze) or on a hard wired CPU (e.g., PPC core as featured by Virtex4 FPGAs). For interfacing input devices and the display to the system, the CPU core is complemented by custom peripheral components. We develop both the peripheral device components and the GUI software stack in a coordinated fashion. 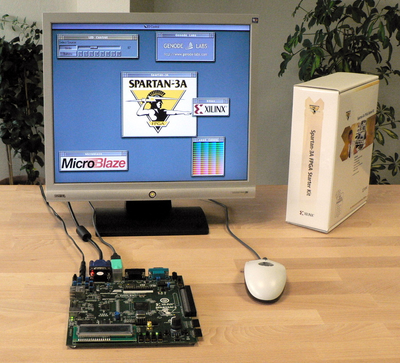 As reference platform, we facilitate the use of the Xilinx Spartan3A Starter Kit with the Microblaze soft core. This cost-effective platform is widely available, for example at Trenz Electronic. In addition to supporting the Spartan3A Starter Kit, we have implemented Genode FX for other platforms including Virtex4-based FPGA platforms, the ML507, and the Euterpe FPGA board. 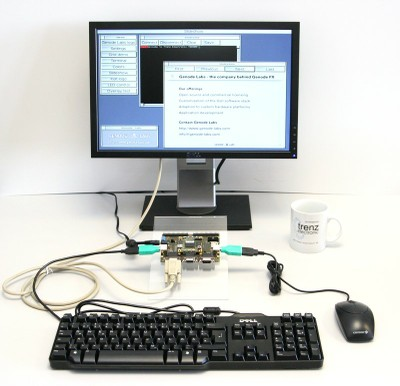 Furthermore, there exist reference designs for the Trenz Electronic TE0300 + TE0304 FPGA platform, which facilitates the use of industrial FPGA modules for implementing embedded graphics solutions. The best way for getting involved with the project is joining our mailing lists. The discussion mailing list called Genode-FX-main is the right place for getting in touch with the Genode FPGA graphics developer community, posting propositions for the development, and for requesting help. The announcements mailing list called Genode-FX-announce is a read-only low-traffic mailing list, which informs you about the progress of the project. Both the hardware models and software components of Genode FX are available under two flavours of licenses, an open-source license and commercial licensing. In return, the GNU GPL requires any modifications and derived work to be published under the same license. See the full text of the GNU General Public License Version 2 in the LICENCE file provided with the Genode FX distribution. For applications that require more permissive licensing conditions than granted by the GNU GPL, Genode Labs offers commercial licensing options and support. If you consider the Genode FX for the use in your product, please contact us.